When you have people working in the cold without the proper gear, their productivity can drop along with -50 Freezer Suit their body temperature. There are a few reasons performance drops due to the cold. First, your body works overtime to fight the cold and keep warm. With all that energy being used, you tire easily and feel sluggish. And all that energy going toward heating means less energy for important things like concentration and critical thinking. Another reason is that the cold is just plain uncomfortable. When you are focusing on being uncomfortable, you are distracted from the job at hand, which means your performance just isn’t as high. Working in year-round cold environments such as frozen food storage can put workers at risk of cold-related illnesses and cold stress. Hypothermia is one of the most well-known cold-related illnesses which can affect workers when their body temperatures drop from 98.6°F to 95°F. Hypothermia can occur even at relatively cool temperatures (above 40°F). You’re especially at risk if you’ve been exposed to rain, sweat or snow, which can significantly lower the body temperature. Therefore, finding a quality freezer suit which is both water-repellent and wind-tight is recommended in many cold storage facilities. Unlike insulated jackets and pants, freezer suits typically offer protection from head to ankle. Without breaks between garments, body heat is trapped continuously for more warmth. The addition of a hood provides maximum warmth and protection for your head. 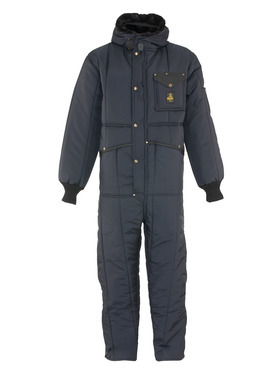 Many full-body freezer suits are designed for walk-in freezers or for outdoors when temperatures drop to subzero temperatures. Using high-quality materials, freezer suits are constructed with insulated thermal fabrics that can keep employees safe and warm while working in climate-controlled environments. Cold employees can be sluggish and clumsy, meaning more chances for accidents at work. In addition to putting their own safety at risk, employees exposed to cold conditions without proper protection could endanger those around them as well. Providing cold weather gear such as a freezer suit can not only improve safety at work, it can also increase employee happiness and satisfaction. The grocery industry already has a high turnover rate, making it difficult for retailers to hold on to good employees.Maximizing worker comfort and happiness should be a top priority for employers if they want to increase their profits going forward. While outfitting frozen storage employees isn’t going to magically induce loyalty in employees, it can greatly increase their comfort level on the job and should be considered. Modern walk-in freezers and freezer warehouses are built with safety releases on the doors to ensure that employees can always get out in case of accidental entrapment. However, there is always the risk of the safety release failing, leaving the employee trapped inside a freezer. Although the risk is small, it can have deadly consequences for workers and their employers. Suiting up in a freezer suit takes minutes and can be worth the extra precaution. Insulation—Be sure to carefully check the insulation before you purchase a freezer suit. The weight of the insulation will give a good indication of how much warmth the suit will provide. Knee Patches—Many workers in the grocery industry frequently find themselves on their knees while they stock shelves or fetch items from storage. Knee patches that are built into the suit can provide additional comfort while they work. Water-Repellent—A wet and cold environment can be extremely deadly and cause hypothermia. Freezer suits with a water-repellent, wind-tight finish can keep out the chill from condensation when moving between temperatures. Tear and Abrasion Resistant—On a similar note, you may want a rugged suit with a tough nylon outer shell that won’t tear or scratch when bumping into cold storage machinery. Freezer Suit Accessories—Don’t forget to provide employees with cold weather accessories such as base layers, gloves, and knit caps. RefrigiWear offers a wide range of cold weather accessories and apparel for grocery industry employees to keep them warm and productive. If you’ve decided to purchase a freezer suit from RefrigiWear, we can enhance the professional appearance of your garment with our embroidery services. You can add your company’s name, logo, the employee’s title, and more with our embroidery, patch, and woven emblem technology!